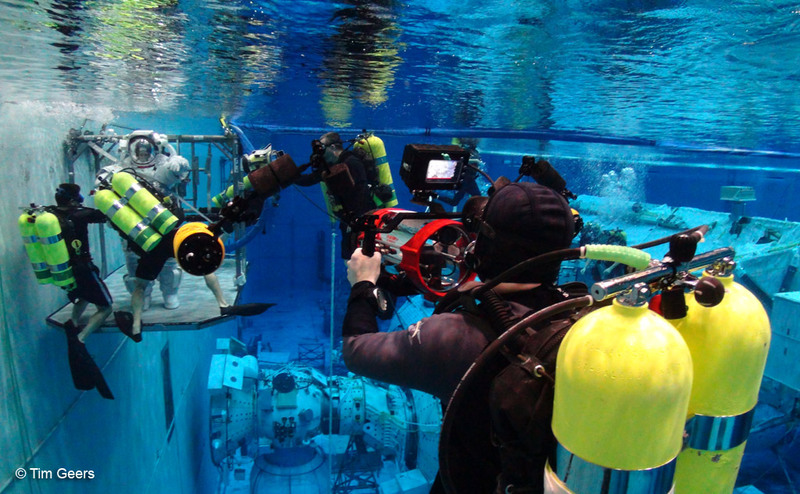 The Blue World Team films at the Neutral Buoyancy Lab at NASA! Posted by Jonathan Bird on Thursday, January 31, 2013. This week the Blue World team shot a fascinating segment that we had been working towards for a long time. 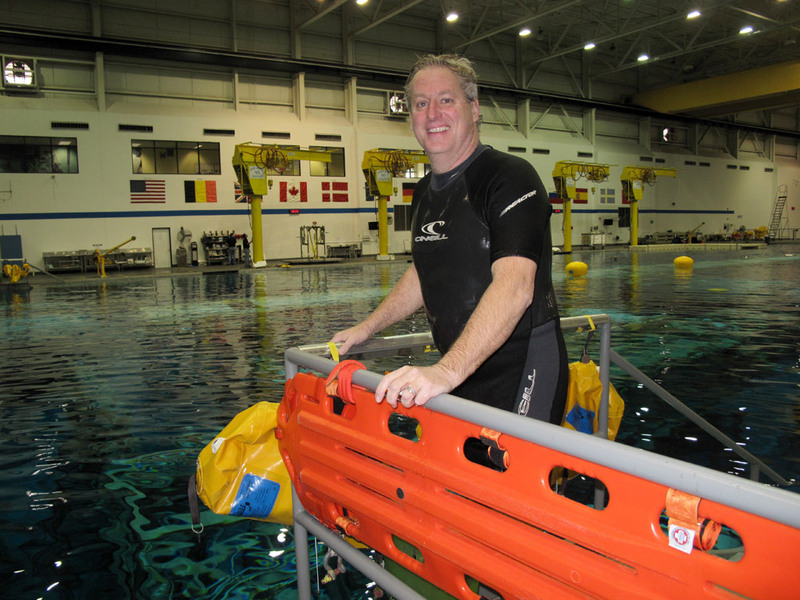 Several years ago we heard about the Neutral Buoyancy Lab (NBL) at NASA and knew we had to make a segment about it. I made a few calls, but could never get through to the right person to discuss it. Eventually, the idea got buried—we figured we would never be able to get through to the right person at NASA. But that idea just kept flickering in the back of my mind and I couldn’t let it go. So for season 4, I decided I would make another serious attempt. This is where karma comes into play. Early in the production of Season 4 we made a segment about Aquarius Reef Base and put it on our website well ahead of schedule because they were looking for as much publicity as possible to gather funding. 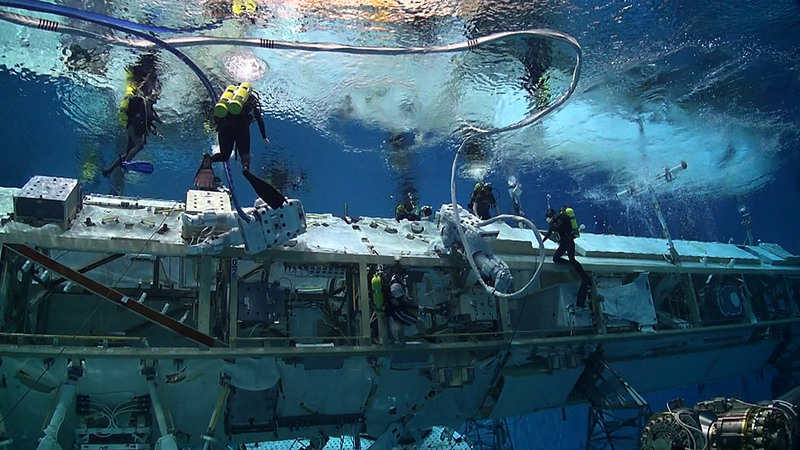 Well it turns out that NASA does a lot of training at Aquarius, so many of the astronauts, divers, staff, and management at the NBL had seen the segment. So this time when I started calling around trying to get permission to visit the NBL, I was talking to people who not only knew who I was, but had actually seen Jonathan Bird’s Blue World and knew we would make a great segment about the NBL. The result? We were welcomed to shoot at the NBL! 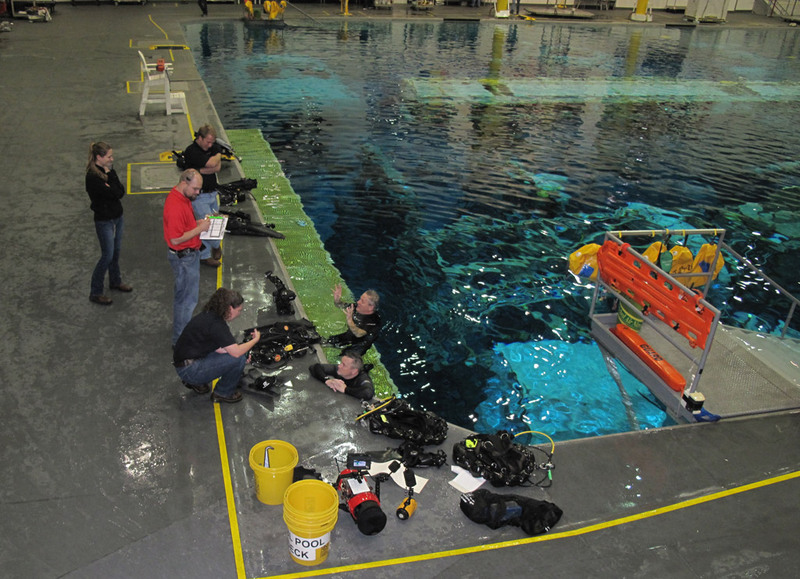 There was just one thing standing between us and the world’s largest underwater training facility—physicals! Yes, you read that right…Cameraman Tim and I had to get incredibly thorough physical exams before we would be allowed to dive in the 6.2 million gallon facility. Fortunately, after several trips to our doctors and various specialists to get the various tests performed, we passed our physicals and got the green light for a visit. We scheduled our visit for a day where they were doing actual astronaut training and we could observe how they handle people in space suits underwater. Editor Tim, Camerman Tim and I flew to Houston on a Sunday and put all our gear together so we could spend a few hours filming underwater with the astronauts on Monday. When we arrived at the NBL bright and early on Monday morning, we were greeted by Dan Sedej, the NBL Facility Manager. He had been guiding our trip the whole way and was super helpful in getting all our permissions set for the visit. He took us in and showed us what is essentially the world’s largest swimming pool. Its dimensions are 202 feet by 102 feet (about half the area of a football field) and an astonishing 40 feet deep! This thing is quite a spectacle to behold from the surface alone, but from underwater it’s simply eye-popping! Before we could dive in the facility, we needed a full dive briefing. We filmed the morning dive briefing with the staff and then met Sara Williams, the Dive Training Officer, who took us to a conference room for our full dive briefing. We learned the “dos and don’ts” of the NBL, where we could go and where to stay clear. The most interesting thing of concern to divers is the breathing gas. Because the safety divers perform heavy tasks underwater and often spend many hours in the water at a time, they breathe a 46% nitrox mixture! (Divers usually just breathe compressed air. Nitrox is a special gas that has extra oxygen in it, the purpose of which is to reduce the amount of nitrogen that soaks into the diver’s tissues on the dives. As a result a diver can stay submerged longer without getting the bends when coming to the surface. A typical “sport diving” nitrox blend is either 32% or 36% oxygen. 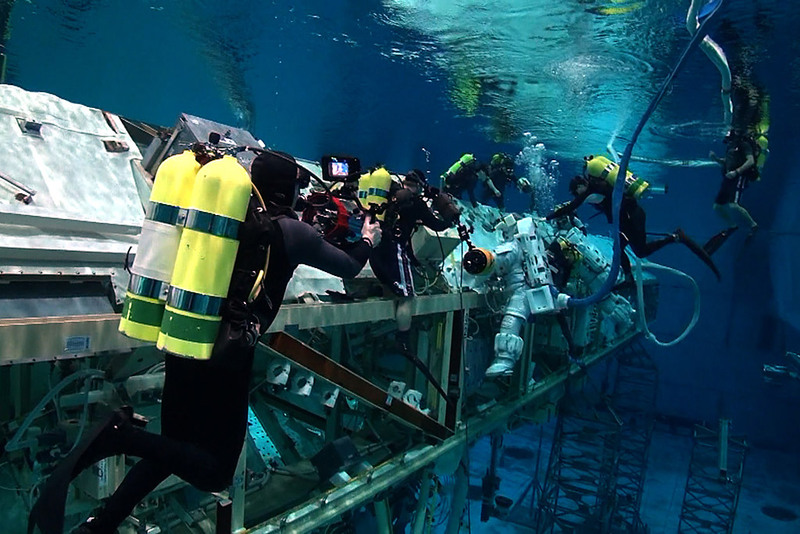 The 46% blend they use in the NBL is very high in oxygen, but they can use it because nobody can go below 40 feet. A 46% blend is not safe below about 80 feet so it’s a shallow-water blend only.) Because the nitrox they use in the NBL is so high in oxygen, they prefer to use gear that has been “oxygen cleaned” to standards for use with pure oxygen. As a result, we could not use our own regulators or buoyancy compensators but instead had to use theirs. And because their divers spend a lot of time in the water, they only use double tank rigs, so we would be diving with twin aluminum 80 cubic foot scuba tanks. If nothing else they look awesome! Before we finished the dive briefing, we got word that they were suiting up the astronauts, so we stopped to go film that. I don’t want to give away everything here, but it was pretty cool to see how they do that, and how they get them in the water. Cameraman Tim and I finally got into the water to film the training, while Editor Tim filmed everything that was happening above water—the control room with its dozens of computer screens and TV monitors, the topside support staff keeping an eye on everything going on underwater, and the equipment being moved and set up for the next mission. The place is a hotbed of activity. As I stepped off the swim platform, I almost had a bout of vertigo because the water is so clear that you think you might fall to the bottom! In fact, I could clearly see all the way from one end to the other underwater--which is at least 202 feet of visibility, probably the clearest water I have ever seen. 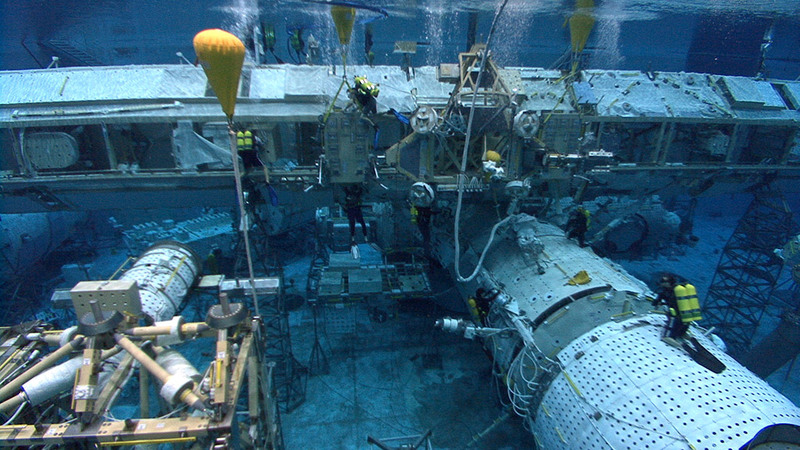 Inside the pool, there is a complete mock-up of the International Space Station. The astronauts practice stuff they will have to do in space over and over in the simulated zero gravity of the NBL. Because the astronauts are weighted to be neutrally buoyant, they hover “weightlessly” underwater just as they would in space. And they can’t really swim around either, because they have no fins and not much mobility in the suit. So each astronaut in the pool has 4 safety divers watching over him or her. The divers not only rescue anyone in trouble, but also swim the astronaut around from one exercise to the next. Tim and I did a two hour dive in the pool and we still had plenty of gas left in our tanks, but we had plenty of footage and were eager to get on to the final event of the day. 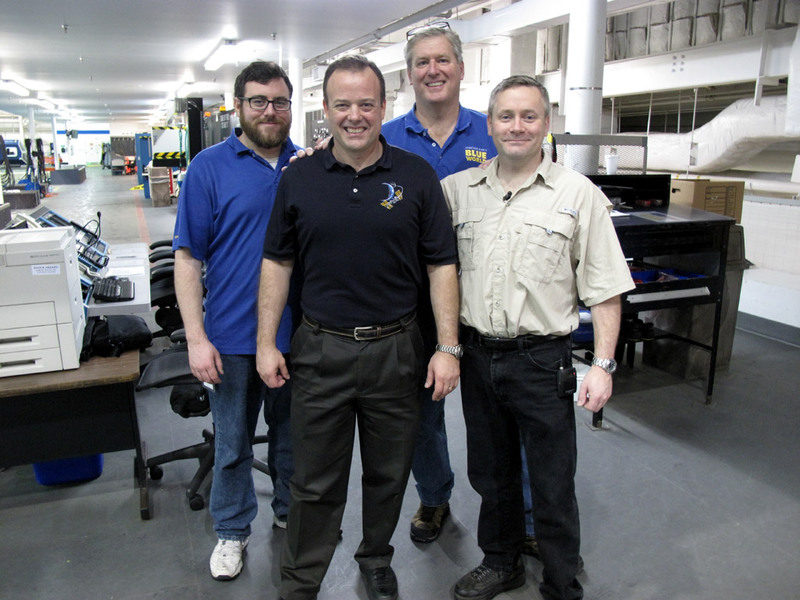 We had an interview with astronaut Ron Garan after lunch (!!) and we needed to get showered off and ready. I knew I liked Ron as soon as I met him. He said “Hey, I loved your segment about Aquarius!” :-) Turns out that he spent 18 consecutive days in Aquarius on a training mission a couple of years ago. We spent about an hour chatting about life in space (he spent 6 months in the International Space Station!!) and about the NBL. Before his mission to fix the Hubble Space Telescope, he spent 500 hours training in the NBL for tasks he would do in space. Needless to say, I thought I had a cool job, but his is cooler! After an exciting day at the NBL, we flew home the next day and need to sort out the 10 hours of footage we shot so we can put together an exciting segment about this cool place. I have a lot of respect for how much training astronauts must go through before they go on a mission, and who have thought that the exploration with outer space would begin with training in inner space? 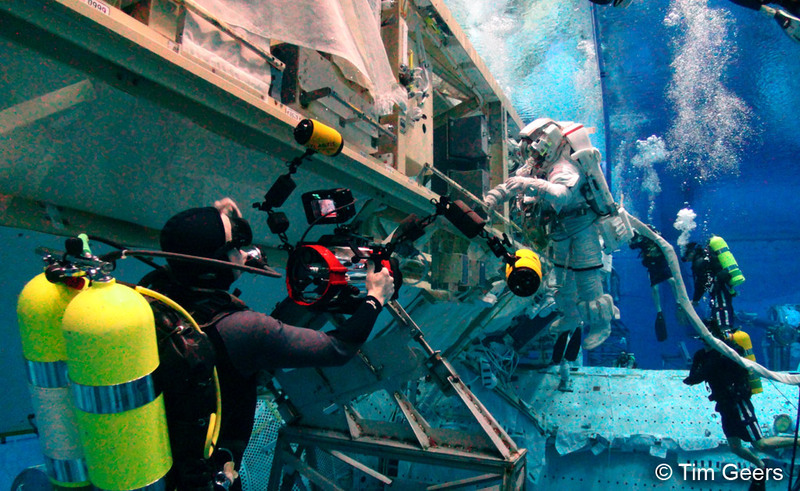 Photo Gallery: The Blue World Team films at the Neutral Buoyancy Lab at NASA!